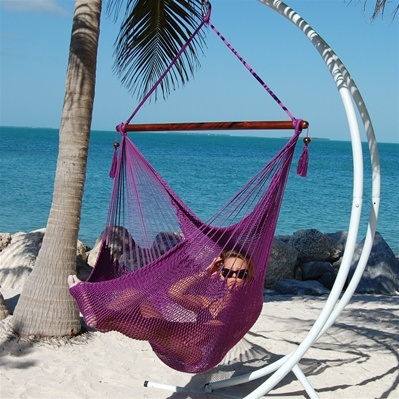 Caribbean Large Hammock Chairs are hand-woven from Soft-Spun Polyester cords. 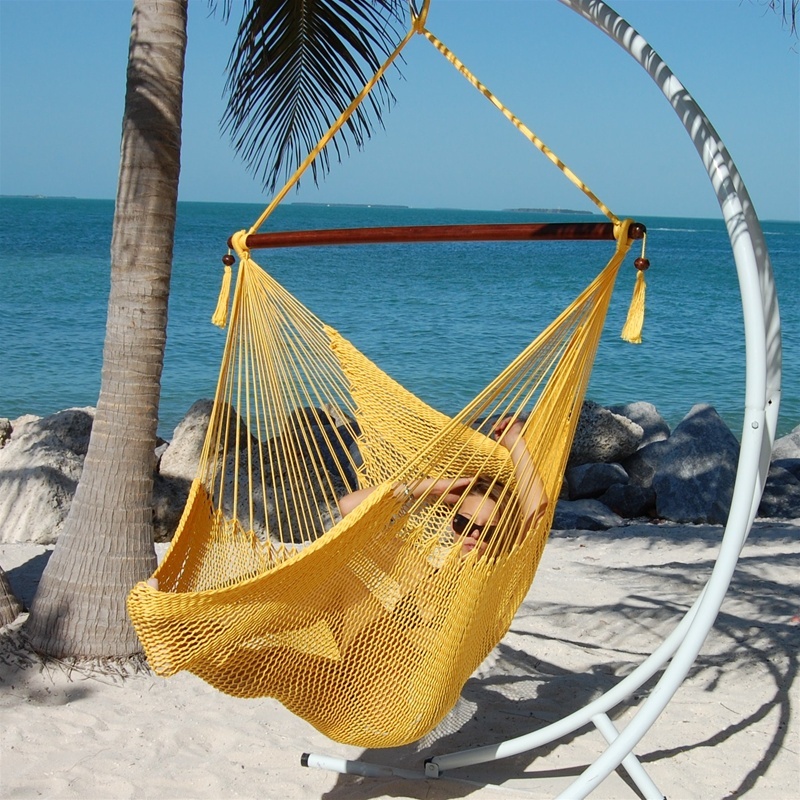 They have a softer feel and are more weather durable than similar cotton hammocks. At 47 inches wide, this hammock chair offers you plenty of shoulder room, an oversized seat, along with a built in footrest. Construction from quality materials and ample dimensions combine to make this hammock chair the most comfortable seat in the house. This chair hangs easily from one suspension point that is 7.5 feet or higher. The hardware is not included in this listing. Selecting multicolor indicates the colors will be random. Hammock Chair suspensions hardware is sold separately. Choose your color now! Caribbean Large Hammock Chairs are made of polyester. The wood spreader is varnished and 47 inches wide. This hammock chair color is Green. 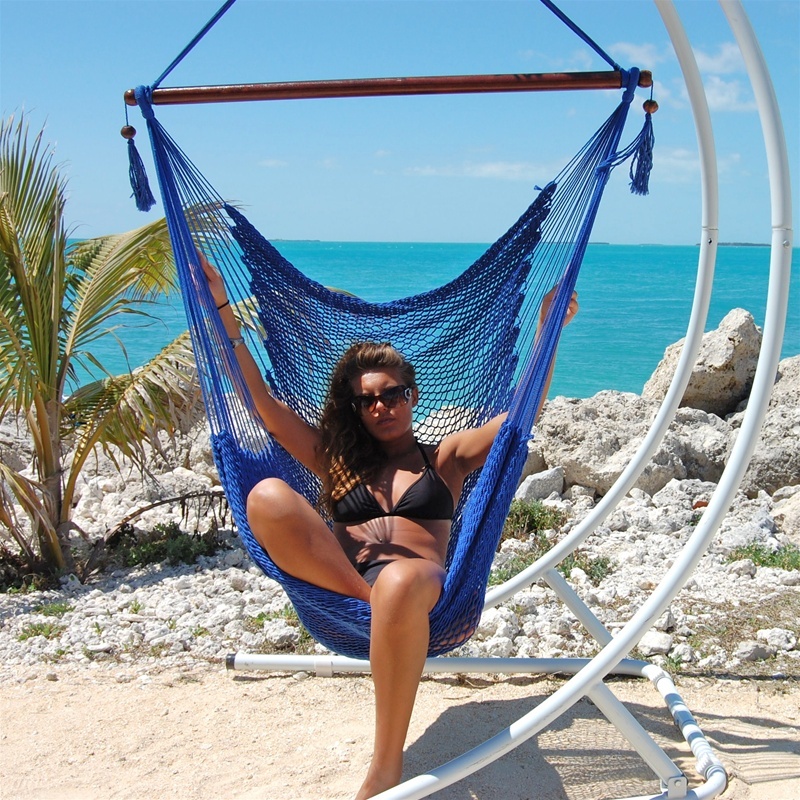 Caribbean Large Hammock Chairs are made of polyester. The wood spreader is varnished and 47 inches wide. This hammock chair color is Tan. Caribbean Large Hammock Chairs are made of polyester. The wood spreader is varnished and 47 inches wide. This hammock chair color is Multicolor. Caribbean Large Hammock Chairs are made of polyester. The wood spreader is varnished and 47 inches wide. This hammock chair color is Light Blue. Caribbean Large Hammock Chairs made of polyester and wood spreader is varnished and 47 inches wide. 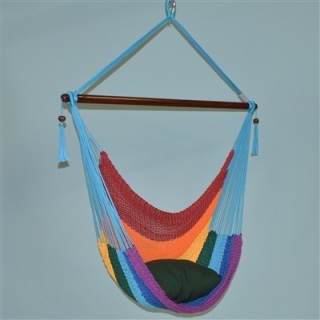 This hammock chair color is Rainbow. Caribbean Large Hammock Chairs are made of polyester. The wood spreader is varnished and 47 inches wide. This hammock chair color is Red. Caribbean Large Hammock Chairs are made of polyester. The wood spreader is varnished and 47 inches wide. This hammock chair color is Purple. Caribbean Large Hammock Chairs are made of polyester. The wood spreader is varnished and 47 inches wide. This hammock chair color is Orange. Caribbean Large Hammock Chairs are made of polyester. The wood spreader is varnished and 47 inches wide. This hammock chair color is Yellow. Caribbean Large Hammock Chairs are made of polyester. The wood spreader is varnished and 47 inches wide. This hammock chair color is Cream. Caribbean Large Hammock Chairs are made of polyester. The wood spreader is varnished and 47 inches wide. This hammock chair color is Caribbean Blue. 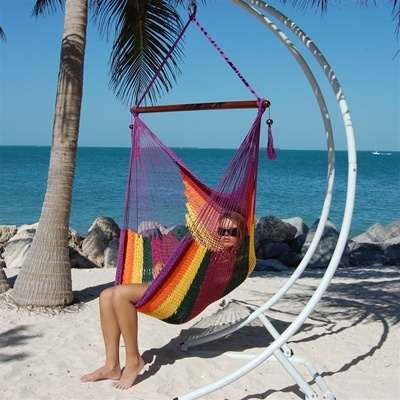 Caribbean Large Hammock Chairs are made of polyester. The wood spreader is varnished and 47 inches wide. This hammock chair color is Mocha.